Malkyrs: The Interactive Card Game, the virtual trading card game with customizable physical cards that come to life via NFC and RFID technology, launches on Nintendo Switch in Q3 2019. After dying in battle, renowned fighters across the legendary world of Heptia find themselves resurrected on the island of Brënn. Yet this second chance comes with grave repercussions: an omnipotent goddess who relishes the thrill of combat wishes to see these warriors battle for all of eternity. There is no escape, even in death. The only way out is victory. Ascending the ranks of these champions may offer the chance to return to their past lives. Battle through the story-based campaign replete with branching paths and multiple endings to learn the rules of the game, then challenge players locally or through online tournaments. Choose from one of 12 champions and up to 10 action cards out of 250 to form a deck, then scan them into the game to begin. Instead of shuffling and drawing each card, all cards will be available at any time in a match to allow for deeply strategic and reactive skirmishes. Both champion and action cards will be able to earn experience and Favor respectively. These resources enable players to upgrade their cards. Champions will earn item and ability upgrade slots, so they can be customized to make the perfect deck. Powering up action cards will unlock specializations, opening up even more possibilities. Faction choices that offer new abilities will further empower players to make cards their own. Each of the 262 playable cards will feature gorgeous art, showing off Malkyrs' high fantasy universe. All cards will be equipped with an RFID that can be scanned using the NFC-enabled Joy-Con controllers. All levels and even the name players choose will be stored in the RFID, so trading a physical card with another player means handing over an entire journey, like swapping heroic tales over a campfire. These upgrades will work across all platforms, including the PC and Mac builds, making cross-play battles a reality. Malkyrs' Kickstarter, which launched Monday and funded in a few short hours, aims to bring the game to new markets, both around the world and on new platforms. With over two million PC matches already played in France, Malkyrs’ huge fanbase is ready for more competitors to join the fray. "By listening to our players, Malkyrs is getting stronger each passing day," said Paul Vaudandaine, co-founder of Malkyrs Studio. "The addition of the Switch audience, who we believe will love the physical-to-digital nature of our cards, can only make our game even better." 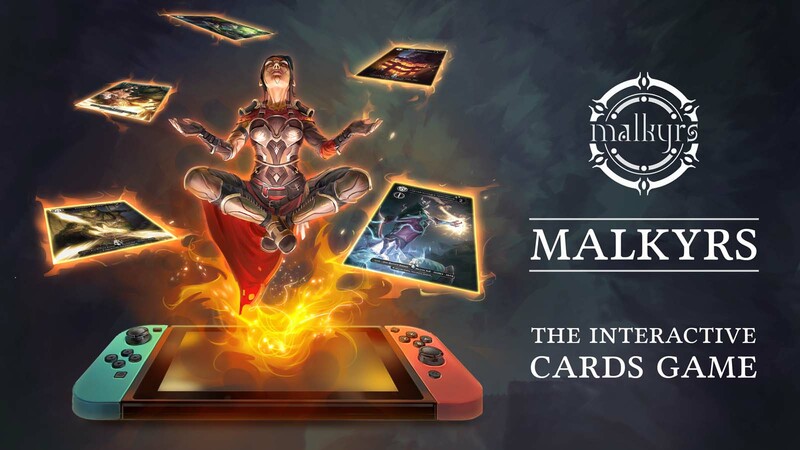 Malkyrs: The Interactive Card Game will be available on Nintendo Switch in English and French in Q3 2019, and is available now on PC and Mac.